In the year 2000, girl culture was clearly ascendant. From Lilith Fair to Buffy the Vampire Slayer to the WNBA, it seemed that female pride was the order of the day. Yet feminism was also at a crossroads; "girl power" feminists were obsessed with personal empowerment at the expense of politics, while political institutions such as Ms. and NOW had lost their ability to speak to a new generation. 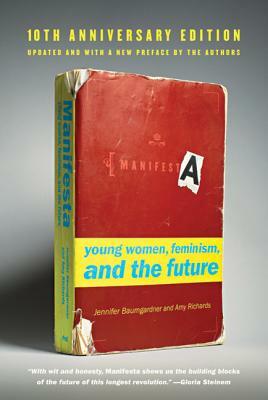 In Manifesta, Jennifer Baumgardner and Amy Richards brilliantly revealed the snags in each feminist hub, all the while proving that these snags had not imperiled the future of the feminist cause. The book went on to inspire a new generation of female readers, and has become a classic of contemporary feminist literature. In the decade since Manifesta was published, the world has changed in ways both promising and disheartening for the feminist cause. Despite major strides forward, the wage gap remains vast; many feminist publications have died; shame around abortion has lingered and '90s-style anti-abortion terrorism has reemerged. Many of the points first raised so bravely in Manifesta remain urgent—namely, why it's still critical for today's young women to focus on gender. This tenth anniversary edition of Manifesta, complete with updated back matter, commentary from the authors, and a provocative new preface, shows why the issues first raised by Baumgardner and Richards remain as timely as ever. Along with Amy Richards, Jennifer Baumgardner authored Manifesta: Young Women, Feminism, and the Future (FSG, 2000) and Grassroots (FSG, 2005) and founded the progressive speakers' bureau Soapbox. Baumgardner is also the author of Look Both Ways (FSG, 2007), among other books. As a cofounder of the Third Wave Foundation and the coauthor of Manifesta (FSG, 2000) and Grassroots (FSG, 2005), Amy Richards is one of the foremost leaders of the Third Wave feminist movement. Her writing and her organizing have made an indelible impact on the lives of young women. She is also the cofounder of the feminist speakers bureau Soapbox and the voice behind "Ask Amy," the online advice column she launched at feminist.com. She lives in New York City with her family.